This post was written for inclusion in the monthly Carnival of Natural Parenting hosted by Code Name: Mama and Hobo Mama. This month our participants have written about their families’ policies on screen time. 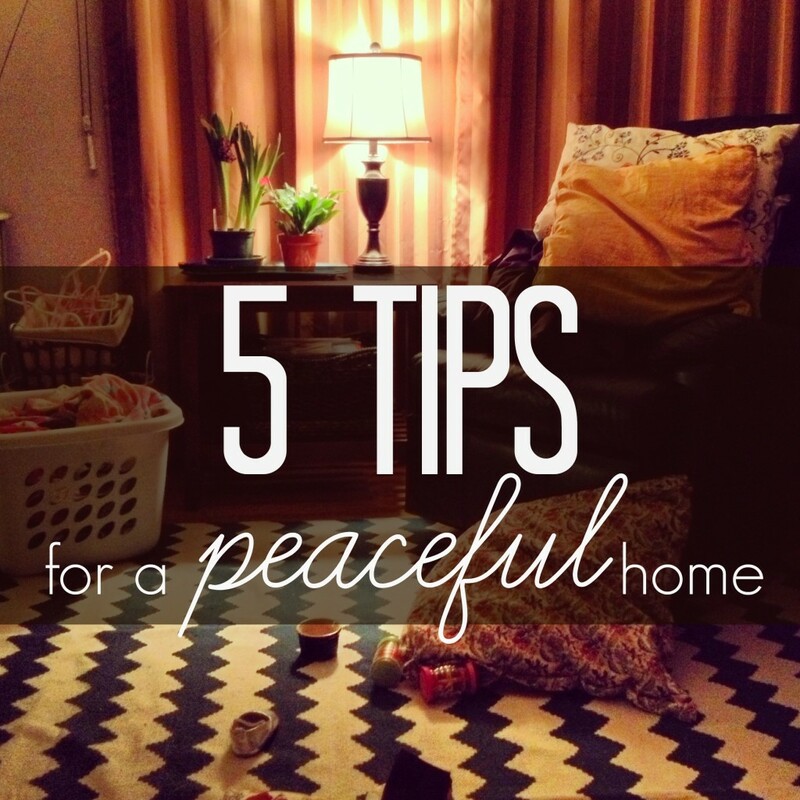 Since we’ve had kids, maintaining a peaceful home has been high on my priority list. We live in a small house, and as our family grows we’ll be living on top of each other more and more. While my girls are small, I’m trying my best to create good habits in areas that are a struggle for me – mainly planning and clutter. If my house is somewhat in order, I definitely feel more at peace and am able to enjoy undistracted want-nothing time with my kids and husband. 1. Make a simple, flexible “rhythm of the home” list. It’s not a set in stone routine, it’s a flexible, flowing rhythm that may change depending on the day. But it’s crucial for kids and their stability for them to know what’s coming. If you have a lot of things going throughout the day or have a lot of kids, it helps your sanity to know what’s coming – and it also gives you the opportunity to block out specific unstructured play during the day, which is incredibly important to kids’ growing bodies and minds. 2. Declutter or make “working zones” and purge often – especially toys & paperwork. I’ve always been prone to clutter. My house is clean, but I’m a collector and there’s just stuff in a lot of places. Since we’ve moved into a smaller house, it’s been high on my priority/challenge list to get everything in a place and keep the accumulation to a minimum. Following blogs like Minimalist Mom and using the free printables at Simple Mom have been helpful. I created a “working zone” where all the mail, bills, papers, and office supplies live so I’m not searching the house for that one piece of paper or a box of paperclips. Here’s an idea. Take 5 or 10 minutes before you go to bed and take stock. What’s in that stack of paperwork on your desk or kitchen table that you really need? Get a “bill basket” and use it for your mail and important papers. Get a cheap but cute filing box and tuck away important papers while keeping them accessible. Keep all tax records and paperwork that needs to be saved in a filing bin out of sight. Walk through your kids’ play area or take stock before bedtime. What have they NOT been playing with? What toys are sentimental to you but your kids could care less about? Put them in a donation box or a box in the garage to rotate in later. 3. Choose peaceful music during quiet times, meal-making, or during bathtime. Keep headbanging and drum solos to a minimum. If you’d like to get into classical music but don’t know where to start, Pandora is a good place to start! 4. Plan in your challenging areas. Not everyone struggles with the same thing, so make a list of yours and create some easy goals for yourself to make your day less stressful. I struggle with coming up with meals, so meal-planning is inconvenient but important to keep my dinnertime stress level at a minimum. It also allows me to meal prep earlier in the day if the opportunity arises. I also started a Crock Pot Pinterest board to help collect slow cooking meals that I can set and forget. Some people need to make “dump lists” where they write down everything that comes to mind in order to sleep peacefully or enjoy time with their kids. There are also helpful housework lists and routines on the web that can organize your daily chores in a simple way, if that’s what you need. 5. Spend undistracted, unwired one-on-one time with your kids. This is the most important! If I’m stressed, my kids are stressed. If my fuse is short because I’m overwhelmed or disorganized, then the whole family, including myself, suffers. So I try my best to keep a handle on things so I can enjoy my kids without thinking about my overflowing to-do list. That said, I usually don’t have a problem ignoring the dirty dishes if the choice is that or a walk through the neighborhood, because some quality time can carry my kids through the hour I need to do chores or work on the computer without an inordinate amount of whining or arguing. What are ways you cultivate a peaceful home? Has Technology Taken Away Childhood? — Jennifer at Hybrid Rasta Mama worries that technology is intruding on the basic premise of childhood – active play in all forms! Join her as she takes a brief look at how play has changed as technology becomes more integrated into the daily lives of our children. Fostering a Healthy Relationship with Technology — Jenn at Adventures Down Under describes her children’s love of screen time and how her family implements their philosophy and policies on technology. Kids Chores for Tech Privileges — Crunchy Con Mommy shares how tying chore completion to iPad privileges worked in her house to limit screen time and inspire voluntary room cleaning! Screens — Without the benefit of her own experience, sustainablemum explains her family’s use of technology in their home. Screen Time – The Battle of Ideologies — Laura from Laura’s Blog explains why she is a mom who prioritizes outdoor natural play for her kids but also lets them have ample screen time. The Day My iPhone Died — Revolution Momma at Raising a Revolution questions the role technology plays in her life when she is devastated after losing her phone’s picture collection from her daughter’s first year. Finding our Technological Balance — Meegs at A New Day talks about how she finds balance between wanting her daughter to enjoy all the amazing technology available to her, without it overwhelming the natural parenting she’s striving for. Raising kids who love TV — Lauren at Hobo Mama sometimes fears what children who love screentime will grow up to be … until she realizes they’ll be just like her. No Limits on Screen Time? Is that Natural? — Susan at Together Walking shares misconceptions and benefits of having no limits on technology and screen time in their home. Screen Time — Jorje of Momma Jorje shares what is currently working (and what hasn’t) regarding screen time in her household. Positive Use of Technology with Kids — Deb Chitwood at Living Montessori Now tells about her family’s experiences with early technology, shares helpful resources from around the blogosphere, and speculates on what she’d do as a parent with young children today. why i will never quit you, TV — How Emma of Your Fonder Heart came to terms with the fact that screen time is happening, and what balance looks like between real and virtual life for both her toddler AND herself. Technology Speaks — Janet at Our Little Acorn finds many uses for technology – including giving her child a voice. 5 Ways to Extend Children’s Screen Time into Creative Learning Opportunities — Looking for a way to balance screen time with other fun learning experiences? Dionna at Code Name: Mama shares 5 fun ways to take your child’s love of favorite shows or video games and turn them into creative educational activities. What parents can learn about technology from teachers — Douglas Blane at Friendly Encounters discusses how technology in schools enhances children’s learning, and where to find out more. 5 Tips for a Peaceful Home — Megan of the Boho Mama and author at Natural Parents Network shares her favorite 5 tips for creating a peaceful home environment. Technology and Natural Learning — Kerry at City Kids Homeschooling writes about the importance of technology as a tool for natural, self-directed learning. Kids and Technology — Rosemary at Rosmarinus Officinalis talks about the benefits of using technology with her preschooler, and includes a few of their favorite resources. Using Technology to Your Advantage: Helping Children Find Balance — At Living Peacefully with Children, Mandy discusses how technology can be used or abused and gives a few tips to help children learn balance. It is almost more important for *me* to be unwired than it is for my kids. I can definitely see an increase in mindful, peaceful connections when I limit my own screen time! Totally agree with this list! Living in a small space here, too, so decluttering and trying to tame the STUFF is a huge and ongoing quest. I also think spending that special connected time together is so important! We’re feeling the pinch with 4, so I can only imagine how 6 must be! When we lived downtown in an apartment, two of the bedroom closets acted as our “garage” and it was a constant challenge to keep space clear and semi-organized! I love the flexible rhythm as opposed to a schedule. We’re the same way – I have to know what I need to get done in the day, and have lots of space to fill in the blanks with the fun, relaxing stuff as we’re inspired. Oh, “saving” is definitely an issue for me! I’ve had to majorly work on my ways, it’s not easy! And I’m very sentimental, so I’ll keep that greeting card from 3rd grade for as long as possible. Great list. I function much better when life is decluttered! I like these tips because they make a seemingly unsurmountable goal–of swimming against the current of “too much”–seem more bearable by breaking it down into smaller tasks. We allow screen time only on weekends during the school year, and then it happens as a reward after chores are completed. I learned a trick from a book called Minimalist Parenting; I put a positive spin on the arrangement by saying “As soon as you finish your chore, you can watch TV!” instead of the more negative “You can’t have any screen time until that chore is done.” Chipping in also builds their self-esteem in a way my praise couldn’t, and we’re all more peaceful when the job is done. Thanks Justine! I sometimes spend the first 10 minutes of naptime just wandering around thinking what I’m going to do first – smaller task list-making really helps. The spinning media time to a positive is a great tip!